BIBIANA (VIBIANA, VIVIAN), (Date Unknown), aside from her name, nothing certain is known about St. Bibiana. A later legend which connects her with the martyrdom of SS. John and Paul (26th June), though popular, has no basis in fact. CHROMATIUS, the second Archbishop of Aquileia (north-eastern present-day Italy) from 388 until his repose in 407. At the Synod of Aquileia St. Chromatius advocated for a strong condemnation of Arianism. St. Chromatius was also friends with SS. John Chrysostom (13th November), Ambrose of Milan (7th November), and Jerome (30th September). EUSEBIUS, MARCELLUS, HIPPOLYTUS, MAXIMUS, ADRIA, PAULINA, NEON, MARY MARTANA, and AURELIA, a group of martyrs during the reign of Valerian (254-259), who were tortured and then killed. Eusebius, a priest, Marcellus, his deacon, Neon and Mary, lay people, were beheaded; Adria and Hippolytus were scourged to death; Paulina tortured to death; Maximus was drowned in the Tiber. EVASIUS, an early, perhaps first, Bishop of Brescia in Lombardy. No further information is extant. LUPUS of VERONA, (Date Unknown), a Bishop of Verona of whom nothing further is known. 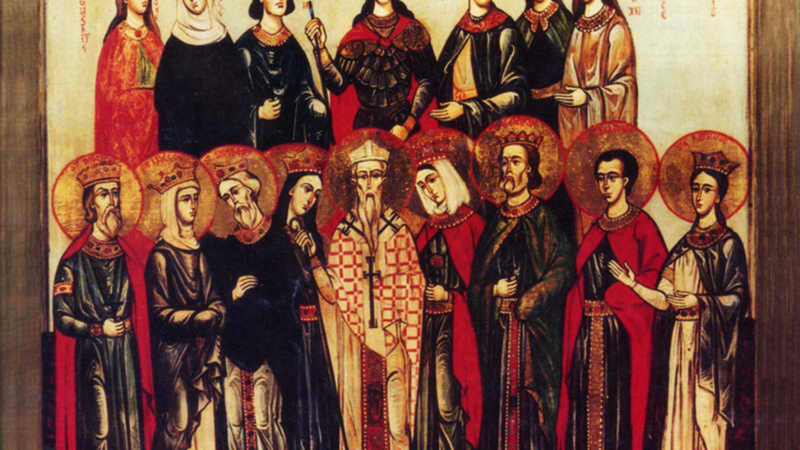 PONTIAN and COMPANIONS, St. Pontian, along with four others whose names are no longer known, was martyred during the Valerian persecutions, circa 259. SECURUS, SEVERUS, JANUARIUS, and VICTORINUS, martyred by the Arian Vandals in North Africa circa 450. SILVERIUS, the son of Pope Hormisdas. He was a subdeacon when elected Bishop of Rome. He was hated by the Empress Theodora for objecting to the Monophysite Bishop Anthimus and condemned for high treason. He was finally exiled to an island off Naples where he was left to die and perhaps martyred, circa 537.